Our department had our holiday cookie swap last Friday, and as usual, I made two types of cookies because I love experimenting with new holiday recipes! Last year I brought these hidden candy cane kiss cookies and eggnog cake cookies, both of which I loved, but I wanted to try something different this year. So I decided to make one cookie that was simple but tasted good (recipe to come later), and one that would stand out more for having a ‘cute factor’, like the popular melting snowmen cookies from last year’s cookie swap (Google it, they’re adorable!). 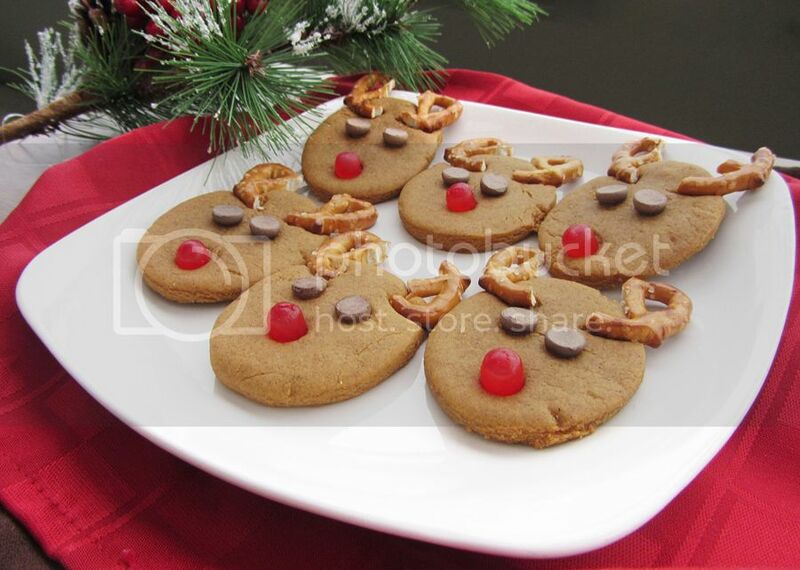 When I saw these peanut butter reindeer cookies, I knew I’d found my cute factor! 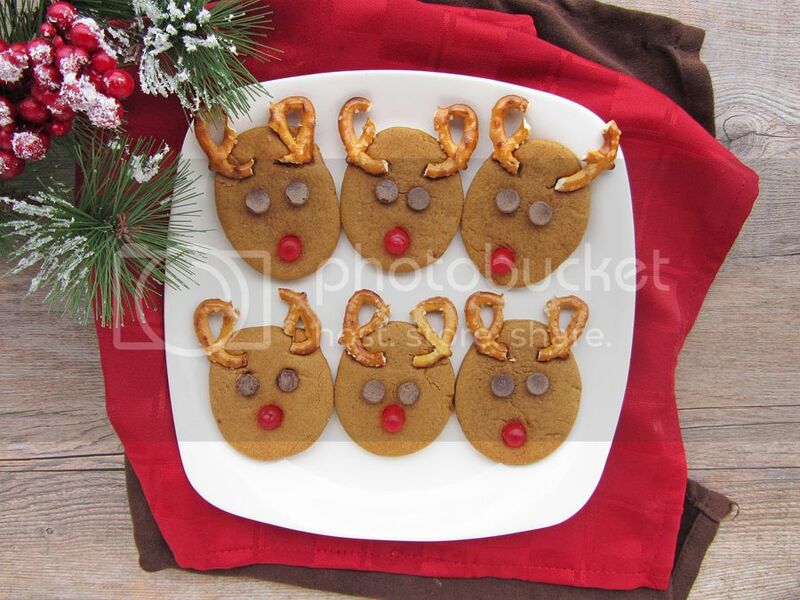 But since I like to keep things nut-free when I’m bringing them somewhere for lots of people to share, I decided to make them into gingerbread cookies instead – not only are they nut-free but they’re also more festive and reindeer-coloured! I used Bakergirl’s gingerbread cookie recipe, cut the dough into ovals for the reindeer heads, then stuck some pretzels on for antlers, chocolate chips for eyes, and red Mike & Ike’s for the nose (though I’ve heard that Mike and Ike have recently split up, so I’m not sure who the red colour is supposed to represent, if it even works that way – mine just came from a bulk bin where all the Mike & Ikes still live happily together). These turned out to be so adorable and got lots of compliments! I also really liked the gingerbread recipe – while they were a bit hard coming out of the oven, they softened up and stayed soft for days in a container. 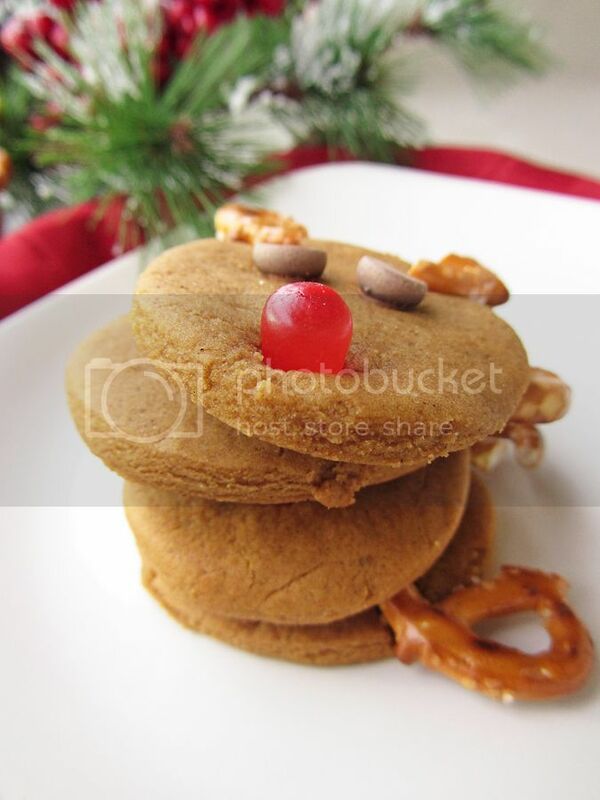 True that the pretzels and candy don’t exactly go with the taste of gingerbread, but you can pick them off and eat them separately if you like, and I don’t think kids would mind the mesh of flavours! If you’re very concerned though, you could always replace the red nose with an m&m – I just liked the 3D effect of the candy! You could also try using chocolate-covered pretzels, they'll just be a little more expensive. Cream together the butter and sugar in the bowl of an electric mixer, on medium speed, until light and fluffy. Add the egg and molasses (tip: coat your measuring cup/spoon with non-stick oil spray before measuring the molasses so it pours out easier) and mix until combined. In a separate bowl, whisk together the flour, baking soda, ginger, cinnamon, nutmeg, cloves, and salt. Add the dry ingredients to the mixing bowl in small additions, mixing on low speed until incorporated. Cover the dough and refrigerate for 2 hours. On a lightly floured surface, roll the dough into 1/8-inch thickness. Don’t worry if the dough’s a little crumbly, you may need to work the dough with your hands for a bit first to get it to roll out smoothly. Cut out 2-inch ovals with a cookie cutter (I just bent my circle cutter slightly to form an oval). Place oval cookies two inches apart on a parchment-lined baking sheet. Break pretzels in half to form antlers, and cut Mike & Ike’s in half so each candy makes two noses. 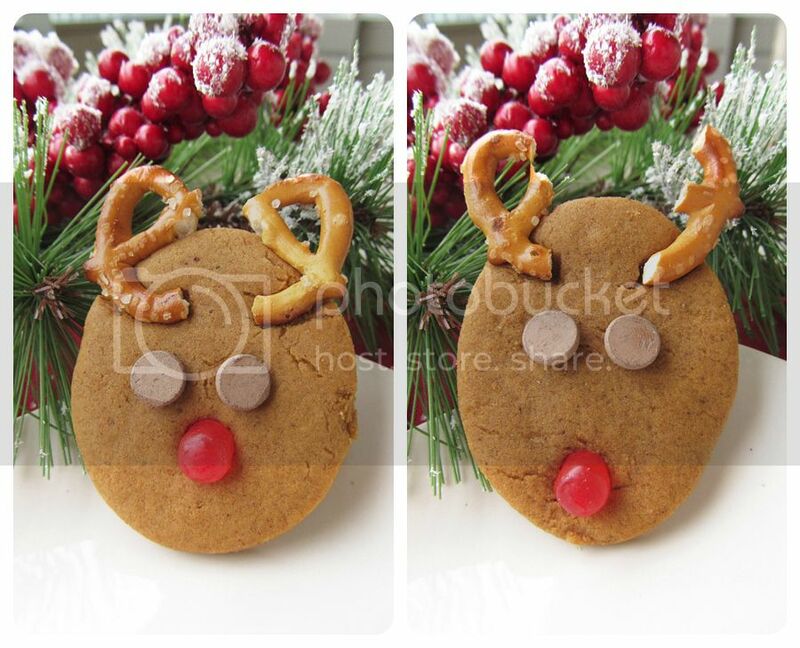 Press two antler halves onto the top of each cookie oval to form the antlers. Press two chocolate chips pointy tip facing down into the cookies to form the eyes, and press one Mike & Ike ‘nose’ below the eyes. Bake cookies for 7-9 minutes or until edges are firm. Let cool on baking sheet for a couple minutes then transfer to a wire rack to cool completely. Reroll remaining scraps of dough and continue cutting out circles and baking cookies until the dough is used up. I had to bake mine in 3 rounds. Store cookies in an airtight container. They may be hard after baking but they will soften up in the container. 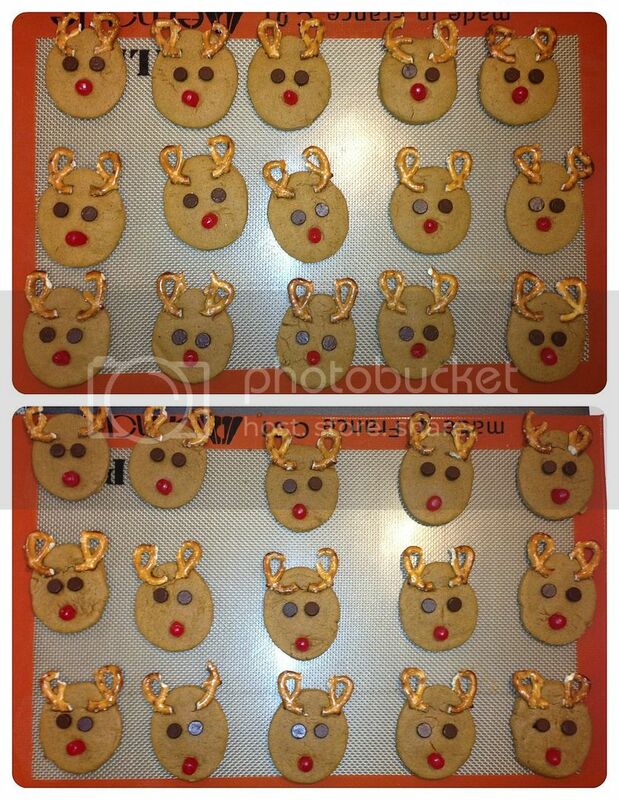 And just so you don't think I only chose the cutest cookies for the pictures (although I did try to do that), here are my phone pics of all the cookies right out of the oven (except for my last batch of 6) - they were all cute and each slightly different!